Collage is often used to show that art has no authentic meaning apart from some collected diversity. Truth and individual creativity are blurred and manipulated. My purpose in layering images and texts into the surface of my paintings is to bring unity out of diversity and to point to the truth and the mystery of Christ. He reveals mysteries and speaks daily in creation (Psalm 19) and is called ‘the mystery hidden for ages.’ He is the Creator of things seen and unseen, Spirit and flesh and the Word Incarnate. He alone unifies all seeming dichotomies, ‘in Him all things hold together’ (Col. 1:15 ff). The Master of layered meanings and metaphor brings beauty and grace to a broken world. My work as an artist and a believer in Christ is an attempt to do the same. The title is taken from an espionage WWII book called Air Navigation and is embedded into this painting. Elementary Dead Reckoning is the process of estimating one's position in air (and marine) navigation, and this term caught my attention as it relates to our position before God. We are dead-men walking! The word ‘reckoning’ means to reconcile or to make an account even or equal. Since we are dead, we are unable to reckon our own position before the Creator of the universe. He is the Dead-Reckoner, whose substitutionary death reckons mankind. Birds, natural air navigators, perfectly illustrate God's protection and reckoning. In Matthew 6:26 Jesus says, ‘Look at the birds of the air; they do not sow or reap or store away in barns, and yet your heavenly Father feeds them. Are you not much more valuable than they?’ And in Matthew 10:29, ‘Are not two sparrows sold for a penny? Yet not one of them will fall to the ground outside your Father’s care.’ The small bird near at the top of the painting seems to be suspended by strings. Ironically these are the underlying mathematical lines of dead reckoning to figure one's position while navigating. The small suspended bird became my metaphor of God's love and sovereignty. It represents those caught in ‘the nets of God,’ a reference to the poem Banding by my friend and poet Suzanne Rhodes. Her excellent poetry has inspired many of my paintings. in the woods where only a wasp moved, flicking cobalt wings. known intimately in the mind of one who flies. G. Carol Bomer is a native of Alberta, Canada who lives in Asheville, NC with her writer husband. She has two grown children and two grand children. Carol received a B.A. in Secondary Education in English and History, and after teaching for six years, she worked toward a Fine Arts degree in Iowa, Kansas, and North Carolina. Carol Bomer, who has worked professionally as a painter since 1976, has had over 40 solo shows in the United States, as well as internationally in the Ukraine, Canada, and the Netherlands. She works in a diversity of mediums, including works in watercolor, pastel, acrylic, and oil, as well as three-dimensional mixed media sculpture and installations. In her work, she seeks to evoke both image and impression, the tangible world and the spiritual world. 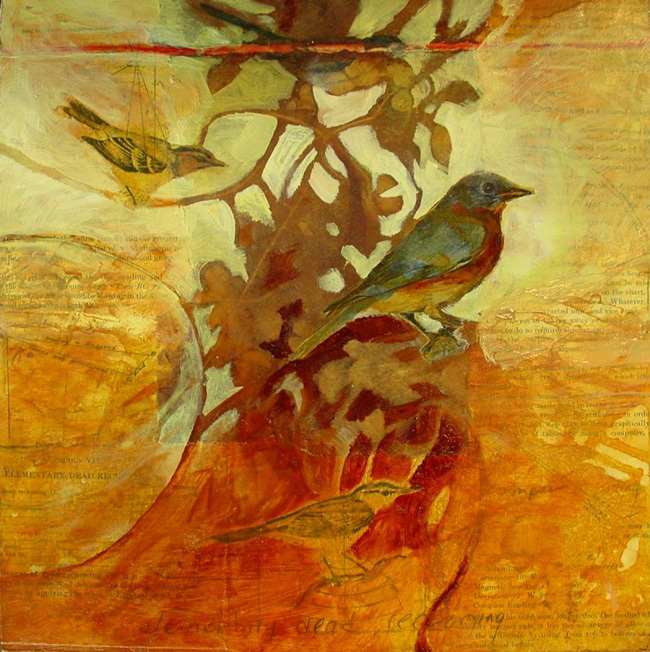 Much of Carol's work is abstracted and gestural, and an Asheville Times review called ‘a silent form of poetry.’ She is equally at home with representational art, fulfilling many portrait and landscape commissions, but technique is always servant to expression. God's Word is Carol's source of ideas and inspiration. She prays that her work will bring glory to God and show truth and love to man. She views her art as ‘a form of play rejoicing before the face of God’ (Rookmaaker). Carol signs her work SOLI DEO GLORIA—to God alone be the glory, which is also the name of her Asheville studio. Elementary Dead Reckoning, 12" x 12", mixed media and oil on panel, 2009. Also available as a giclee print 12" x 12" on all rag watercolor paper.